Grandma's Little Pearls: Much Better Late than Never! Much Better Late than Never! We had nearly a two month delay in this little gals birthday outing with Papa and I. Things kept coming up between our schedule and her family's schedule that kept our special time together from happening. We had celebrated her actual birthday with her but her birthday gift from us was the outing. The outing was to include a movie of her choice, a dinner out of her choice, and a shopping trip. Her special day finally arrived. 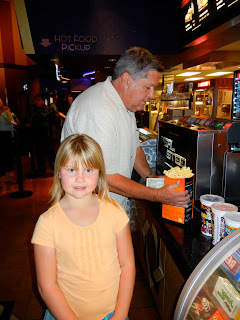 She is our little chatter box and she talked non-stop all of the way to the movie theater. It was fun hearing all she had to share. We went to see the new Smurf movie. She plopped herself down right between Papa and I in the movie theater (still chattering). She couldn't have been any more excited about finally getting her special one on one time with us. It was a really cute movie by the way. After the movie we went to dinner. When asked where she would like to go shopping. "All of my friends always talk about going to Dollar Tree!" "My mom will never take me to Dollar Tree." "I really want to go to Dollar Tree!" some more things to add to their school playing box. We were in Dollar Tree for no less than 45 minutes. She carefully make her selections. sisters all of the new school stuff she had chosen. 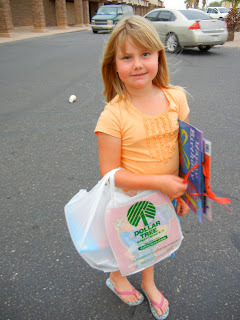 to tote all of her new supplies home in. seven years and 2 months year old. She thanked Papa and I for each and every thing along the way. with our grandchildren are an absolute keeper! I love that idea. It's a wonderful tradition for sure. Sounds like all of you had a wonderful day! Definitely worth the wait! Isn't it amazing how they can chatter at super sonic speed? Beautiful little girl, and obviously sweet, too! And aren't you lucky that she wanted Dollar Tree!